The Capri Beauty Farm, one of Europe's most prestigious and modern spas, is located in the hotel. The spa offers ancient treatments such as "Thalassotherapy," therapy that uses products from the sea, along with a modern menu of botox, skin peels, manicures and pedicures. Anne-Marie and I had our eyes on the unique “Vinissimo” package, a four-night stay in a garden suite that includes wine classes and wine-based meals geared toward educating the guests about the powerful antioxidants found in grapes. The spa treatments in this package include a seaweed and grape detoxifying treatment, skin peels, massages and facial masks using grape extracts. 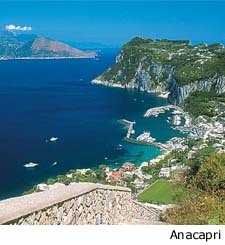 The sunny village of Anacapri is just steps from the Capri Palace. Stylish restaurants and quaint cafes line the picturesque streets, and the town is a great place to browse for local art wares. Dozens of small boutiques sell everything from sandals to ceramics. 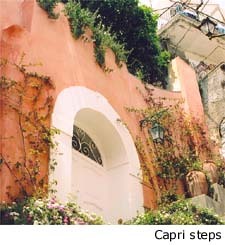 We stole back to Capri town in the late afternoon with a mission to poke around the shops there and relax at one of the cafes. 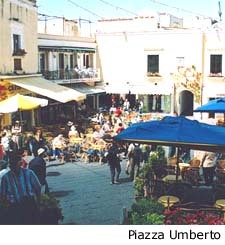 Life in Capri centers around the Piazza Umberto, the main square in the center of town. Cafes and shops surround an ancient clock tower and spread around the square to the edge of a patio that overlooks the sea. Shops selling caprese cheese and salami, local wines, olive oils, fresh bread and an endless selection of pastries primed our appetites, and we found a shady spot under a colorful umbrella to sit for awhile. We ordered a light snack and sampled a refreshing Limoncello di Capri, a liqueur made from lemons grown on the island. Capri is wonderfully sophisticated, but not for the faint of heart. It is the Land of a Thousand Steps! If a description reads that there are 68 steps, don't believe it! That doesn’t mean from the street level; add another 40 steps and you might be right. The town is designed for walking and comfortable shoes are a must. There are several terrific walks around the town and just outside of town. An hour’s walk brings one to Villa Jovis, or Jupiter's Villa, the ancient home of Emperor Tiberius. Heading south from the villa one can take in the Natural Arch, Via Krupp (an incredibly steep, winding road that leads down to the sea) and the offshore rock formations of Isola Faraglioni. We decided to stick to town and wandered around the streets surrounding the square. We were captivated by one tiny shoe shop run by an older gentleman who was not more than five feet tall. We loved what we saw and decided to have some shoes made. Anne-Marie chose a pair of white Capri sandals, and I ordered a pair of hot pink loafers. The proprietor warmed to us and pulled out a photo album of his past clients. Imagine our astonishment when he flipped through pictures of Jackie Onassis and Sophia Loren wearing his shoes! We knew we had a full day the next day with villa appointments, plus we wanted to see as much as possible of the island, so we struck out early in the morning for Villa Marina near Marina Piccola. Charmingly appointed, the endless terrace with built-in banquettes offers breathtaking views of the seashore and the coast below. A stroll through the spectacular gardens laden with lemon trees and lush vegetations affords dramatic views of the cliffs of Faraglioni and the sea beyond. We had a little time before our next appointment so we used this chance to visit Villa San Michele. The villa lies within walking distance of the main piazza and is a tranquil sanctuary in the middle of the bustling town. The gardens are a feast for the senses – rosemary, lavender and the ever pervasive lemon trees surround a pool where ancient trees provide a cool respite. Our next stop, Villa Mafalda, was quite near the Blue Grotto and we only wished that we had the time to explore the magical cave. An underwater entrance to the cave reflects sunlight onto the walls of the grotto, turning the interior into a luminous blue that dances around the cavern. We realized that no visit to Capri is complete without spending at least a few hours out on the sea. Chartering a small boat and exploring the secluded bays and empty beaches along a shoreline inaccessible by car is a must. Our time on Capri was too short, though, and we left hoping we would return to seek out these hidden pieces of paradise for ourselves someday soon.